Once again, Columbia City Bakery’s own Evan Andres has been nominated for a prestigious James Beard Award–the country’s top food award (often referred to as the “Food Oscars”). The full list of chefs, bakers, restaurants, and bars that have been nominated can be found here. Photo by Kelly O. The Stranger. Given your background in finance and sales, how did you come to be the purveyor of such dandy garments? Well, as I like to tell people, I started running with a younger woman, and she wasn’t ready to retire. She also wanted me to clean out our closets. I’ve always loved clothes. The shop started from the nucleus of my own wardrobe. It must be hard to resist snagging the best stuff for yourself. It’s so much fun. I’ve been known to change clothes three or four times a day. I cherry-pick a bit from thrift stores, but at least 75 percent or more of what I carry comes from customers. I trade for generous store credit. It behooves me to give them a good deal. You’ve been running the shop for two years, and living in Columbia City for three. That means you’re part of some of the big changes that have been taking place down there. Has there ever been any tension with longer-term residents? I haven’t felt a backlash. There has been very little negative vibe. It’s a very welcoming neighborhood, and I try to carry things for everyone. I’m not looking to be a smoothie. Photo by Allison B. From the CC Facebook page. 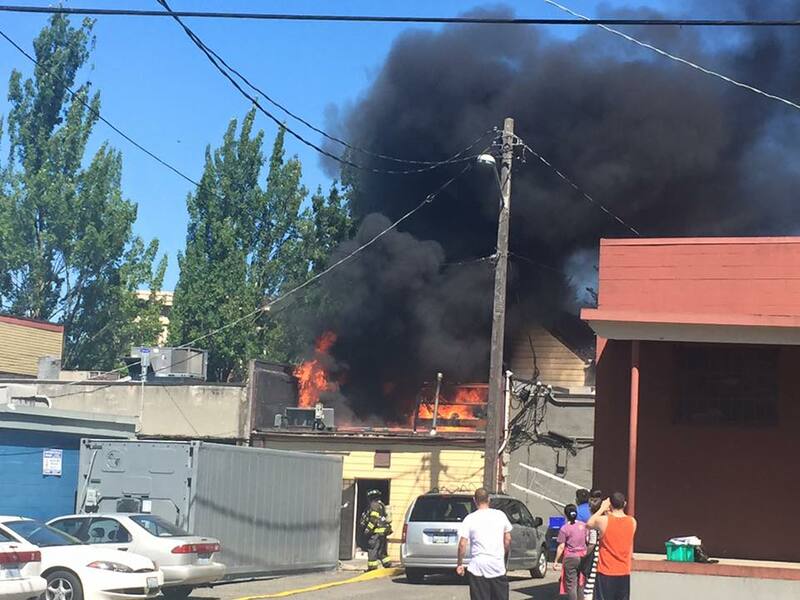 As I’m sure just about everyone in the neighborhood is now aware, a Columbia City and South Seattle cornerstone, Bob’s Quality Meats, is now closed after getting hit by a major fire on Thursday, July 2nd. The fire started around 3pm on the roof and spread to a small, wooden rooftop structure used as an office, bathroom, and storage for Bob’s. The 2-alarm fire was contained by the Seattle Fire Department within an hour of being first reported and the SFD response was massive. One count reported a total of eleven trucks on Rainier and the side streets. The fire was primarily limited to the 100+ year-old building that Bob’s occupies, with some minor damage possibly spreading next door into Gather. 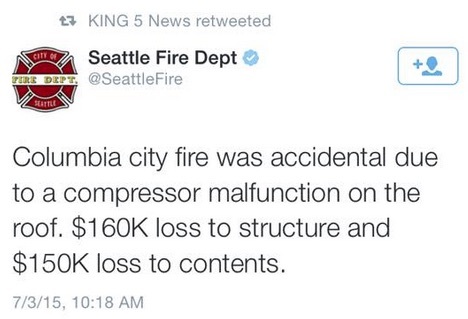 According to this tweet released yesterday by the SFD, the fire was accidental and due to a malfunction with rooftop machinery. When the fire was first noticed, the west side of Columbia City’s business district was quickly evacuated. There were no reported injuries. The Bob’s fire comes right at the butcher shop’s busiest weekend of the year and will be a major financial blow. A number of neighbors have commented on Facebook that the family that owns Bob’s is also the owner of Hillman City’s pet store, Claw and Paw’s Pet Grocery. Shopping there for your pets could be a good way to show your support. There have also been numerous calls for crowdfunding efforts to help Bob’s out. At this point, a focused philanthropic effort from the neighborhood has yet to emerge. If such a site does come to fruition, we’ll update Columbia City Source with the details. Beyond the financial loss over the 4th of July weekend, the fire is an emotional one as well. Bob’s has been in the neighborhood for 30+ years (see this 2008 Seattle PI article for the history), has a loyal and diverse clientele. and is absolutely one of the neighborhood institutions that makes Columbia City what it is.